Lovingly styled with a French provincial theme, Athelney Cottage is a stunning self contained cottage nestled amongst some of the oldest trees in the heart of Adelaide. We welcome you to relax and unwind in the charm of our modern country bed and breakfast. 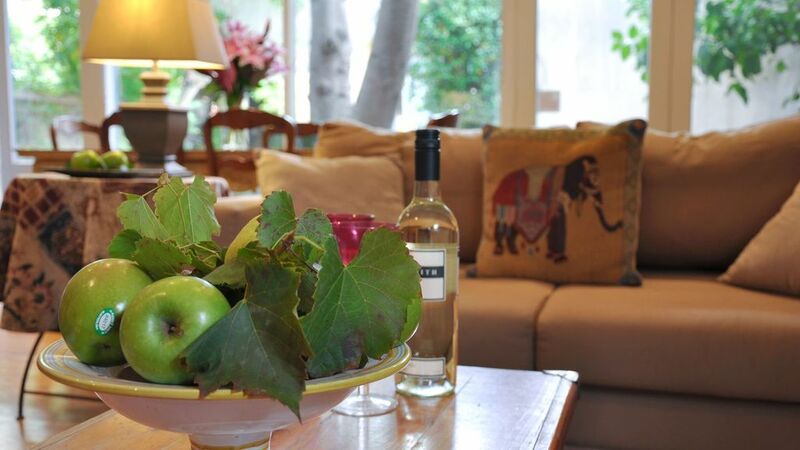 The Cottage is located near the National Wine Centre and Adelaide Botanic Gardens, providing a secluded getaway only minutes from the many activities Adelaide has to offer and positioning you to easily travel further afield. This self-contained bed & breakfast cottage will provide you with a “home away from home” (as recommended by Delicious magazine and SA Tourism Commission), including breakfast provisions and all the comfort and modern conveniences you’d expect. The Executive suite is a large fully furnished bedroom/lounge combination. It's perfect for 2 adults and has everything you need. It has 2 sofas, a fireplace and a dining table for 6, perfect for a dinner parties. We very much enjoyed our stay at Athelney Cottage. The cottage was very nicely decorated, we had everything we needed, and it was in a great location. Air conditioning and fans very much appreciated given the hot weather during our stay. Rosie was very welcoming and we’d love to stay at Athelney Cottage again.